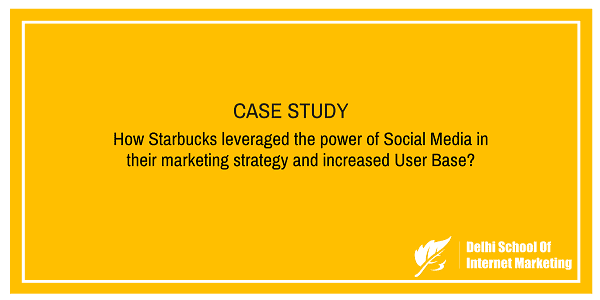 CASE STUDY: How Starbucks leveraged the power of Social Media in their marketing strategy and increased User Base? Home > Blog > Blog > CASE STUDY: How Starbucks leveraged the power of Social Media in their marketing strategy and increased User Base? 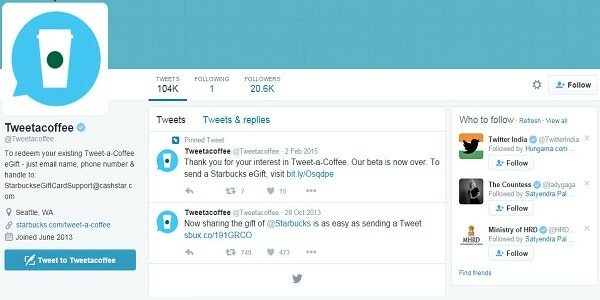 2) How Starbucks uses social media platforms? Starbucks is a part of everyone’s daily life. Starbucks was one of the first companies to offer free Wi-Fi. Starbucks has used social media as their best platform to communicate with its customers. Starbucks reported net revenue of $16.4 billion for fiscal year 2014 (an increase of 11% from the previous year). Starbucks Coffee was established as a single store in 1971, in Pike Place Market, United States. Initially they were a retailer of whole bean and ground coffee, as well as tea and spices but now they have moved forward and nearly 23,450 retail stores in 65 different countries up from 19,767 from previous year. Starbucks uses each social media platform to reach out and stay connected with their dedicated fans and followers. Here is the list of all the social media channels that Starbucks uses. How Starbucks uses Social Media Platforms? Many CEOs talk about how social media and digital platforms are the future, and that their companies are adapting in order to take full advantage. However, the reality is that few really understand the complex triangulation between consumers, a product, and social media, and how the three, when successfully managed, can increase a brand’s profile and generate higher sales. The Starbucks Facebook page was created in 2008. Starbucks has more than 36 million fans. Starbucks uses Facebook as a platform where their fans can connect with them for open discussions to share their stories, ideas, suggestions, or comments. Through Facebook, Starbucks directly and actively connects with its fans. Fans can also build their own virtual images and share it using Facebook. 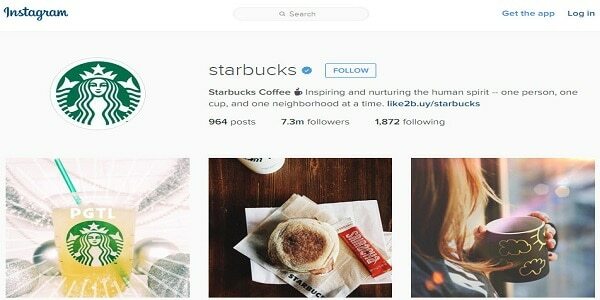 Starbucks through Instagram interacts with customers through the photo-sharing option. Starbucks has 7,313,655 followers on Instagram who keeps active eye on the updates over the platform. Currently Starbucks has approximately 11,172,043 followers over Twitter. Starbucks engages with their followers on regular basis by responding their queries and re-tweeting what others say about Starbucks. Twitter followers may also get an e-coupon for a new coffee or can build their own virtual drink and share it over the Twitter platform. Starbucks has 87,995 people subscribing to its YouTube Channel. Starbucks videos on YouTube are actually related to coffee in general rather than focusing highly on their brand or products. This is the reason YouTube has gained a huge subscriber. Starbucks uses marketing videos in addition to informational videos to provide information and make connections with their followers and viewers. Starbucks shows off many informational videos like origins of different coffee blends, making the perfect coffee, farmer stories in Costa Rica, and much more. Starbucks, in order to popularize itself, allows people to embed its videos anywhere on their website. Starbucks has more than 4,438,109 followers on Google+. Starbucks posts content on a regular basis. Google+ posts are majorly from its Twitter feed and Facebook page. Starbucks has 231,178 followers on Pinterest. Starbucks uses Pinterest boards as an extension of its storefront or website. Currently it has 2881 Pins over the platform. 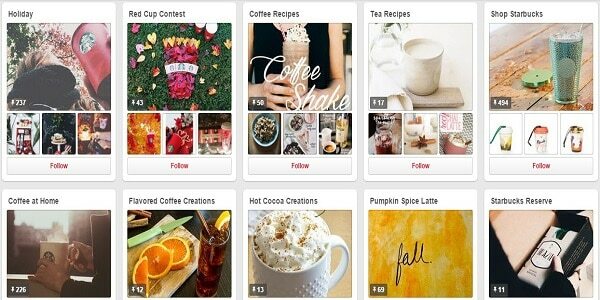 Starbucks interacts with customers through the photo-sharing capabilities of Pinterest. Launched on Oct, 28 in 2013, the campaign enabled people to give the gift of a $5 gift card just by putting both ‘@tweetacoffee’ and a friend’s handle in a tweet. The coffee wasn’t free though and in order for it to work, users had to link their Starbucks account to Twitter and their credit card to the account. As a result, by the end of December- more than 27K fans had tweeted a coffee and 34% of users bought multiple gift cards and 32% of purchase happened on the first day. Around $180K worth of coffee had been bought through the promotion. In 2009, company started testing its mobile app & launched myStarbucks app that allowed users to locate stores at various locations. More than that, the app allows its coffee lovers to place their orders, pay & pick up without any wait or queue. These social media platforms have been effectively used by Starbucks in order to enhance their capabilities and grow rapidly. Starbucks keeps sharing valuable contents through all these social media platforms. Apart from this, Starbucks responds to their fans and followers and listens to them with the aim to serve them better and take valuable ideas and feedback. By doing all of these, Starbucks become able to show it openly that it cares for the fans and makes them feel that they are an integral part of the company. Starbucks understands their audience and the importance of social media. In June 2010, Starbucks was awarded the World’s most popular Social Media Consumer Brand-based on its Facebook fans, Twitter followers and YouTube subscribers. Taking a giant leap, most recently, Starbucks has announced that it will open 500 new stores in China in 2016. This will give a major pump to the company’s growth. [su_box title=”More Case Study From DSIM” box_color=”#c7c7c7″ title_color=”#000000″ radius=”5″]1) CASE STUDY: How Pepsi is using social media platform to compete with Coca-Cola? 2) Case Study:How Sharekhan increased leads count through a training campaign leveraging digital marketing?